Today was not a guide trip, we just went fishing with our good friend, George Born and a good friend of his, Kent Collums, who is the head football coach of Abilene Christian University. 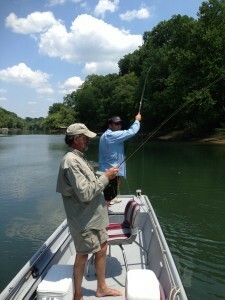 Kent has been coming to the Little Red River for years to fish with George and he picked a great time for this trip. The weather is fantastic and although the water is low and a little off-color the fly fishing continues to be off the charts. We all three had fish on at the same time eleven times (5 Triples) and by 2:00PM we were all tired from releasing so many feisty Rainbows. Almost any sowbug pattern with a drag free drift results in a dandy Rainbow. We look forward to following Kent and his football team this fall; but in the meantime we are going to enjoy some really amazing fly fishing on the Little Red River. 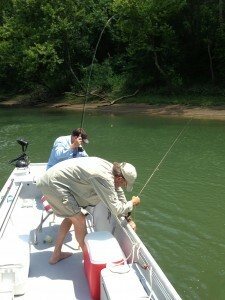 Hope to see you on the river this summer!